This hall has been central to Bethesda life for generations, providing a venue for markets, meetings, theatrical performances and charity concerts. One concert, in December 1899, was in aid of the widows and orphans of British soldiers killed in the Boer War. The performers were applauded, but what attracted most attention was the new-fangled gramophone! In 1898, future Prime Minister David Lloyd George addressed a crowded Liberal meeting here and referred to a recent Penrhyn quarry dispute, saying that the conduct of the quarrymen in “those trying circumstances” had won the admiration of workmen generally. During the Great Strike of 1900-1903, the Market Hall was the strikers’ main venue for mass meetings. When the quarry re-opened in June 1901, there was a day of demonstrations by strikers, at the end of which the crowd marched from Pont Twr to the Market Hall. The banner at the front of the procession proclaimed: “Be faithful to your fellow workmen.” In the hall the flag was loudly cheered, as was Mrs Elizabeth Williams. The previous week, she had been convicted of breaching the peace. She was had to pay costs and a 5s fine for being part of a crowd that demonstrated against those who had returned to work at the quarry. Markets were held here on Saturdays and Mondays, and went on late into the night. In 1907, a complaint was made to the urban council about the hall's dangerous condition, noting that when the hall was “crammed with people on Saturday nights” the paraffin and naphtha lamps were “a source of great danger”. The complaint was prophetic. The hall caught fire on Sunday 11 July 1909. Bethesda had no fire engine or brigade but every able-bodied man came out to help and the fire was extinguished by 10am, three hours after the alarm was raised. 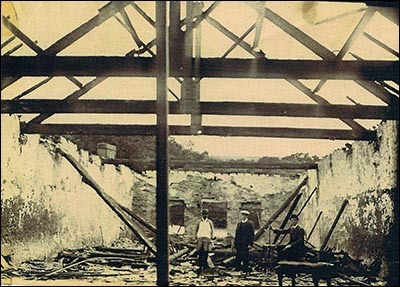 The hall was gutted, with only stone walls and “one or two charred rafters” remaining, as shown in the photo (copyright: Gwynedd Archives Service). The adjoining Victoria Hotel was lucky to survive. It was rebuilt and, now known as Neuadd Ogwen, continues to play an important role in Bethesda, with concerts, films and community events taking place. It acted as a post room during the severe snow of 2010-11, when conditions prevented deliveries to several local villages.